One of Pierson's orchid and fern creations for sale. PORTLAND, Conn. - "It's nice to sell something people like." For 12 years, Steven Pierson, the great grandson of Anders Nels Pierson of A.N. 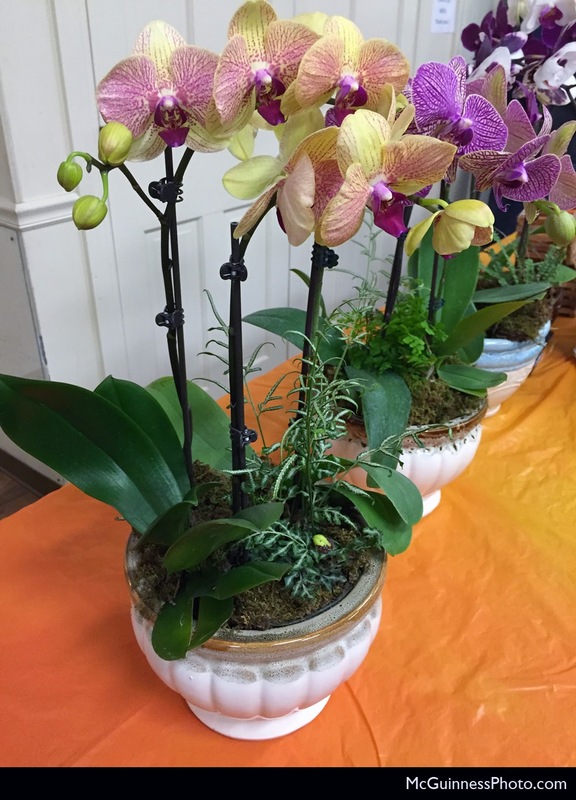 Pierson, Inc., has been supplying flower shops with his orchid plants. He has found that people like to grow orchids, especially when they rebloom. 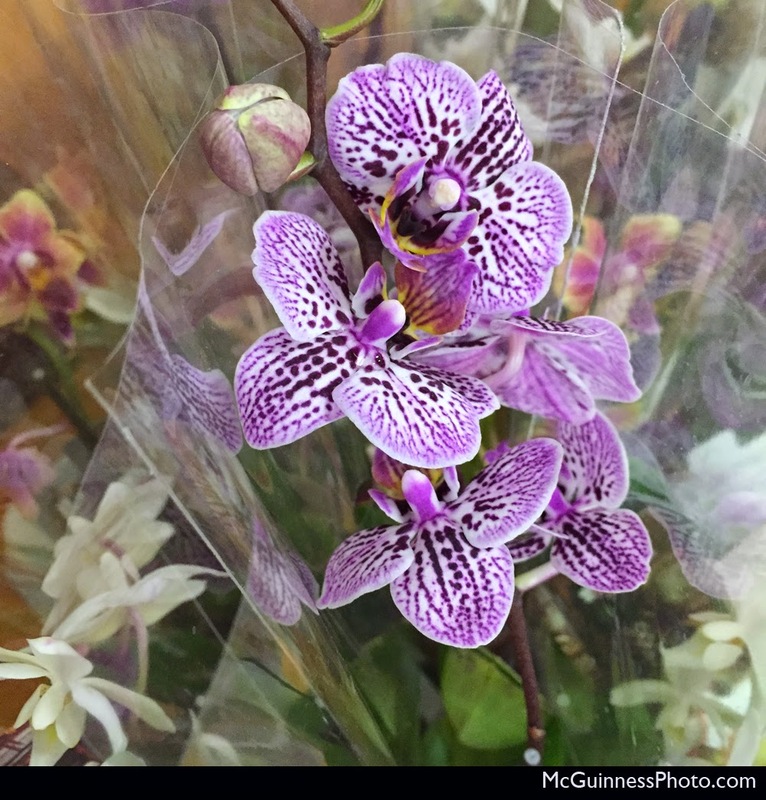 "Usually a year later [after purchasing the orchid] they come back. I'm shown pictures all the time of when they rebloom. When that happens, they get excited." His new store, Natural Affairs Flower Shop, opened April 20 and will serve as a home base for his orchids. 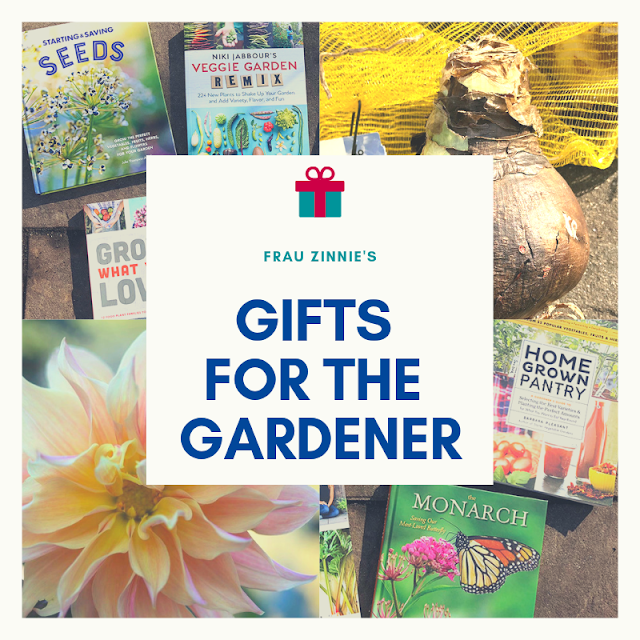 He recently shared his tips for growing phalaenopsis (moth) orchids during a lecture to the three garden clubs of Portland: the Brownstone Garden Club, the Portland River-Valley Garden Club and the Portland Garden Club. "A lot of orchids are hybrids now. 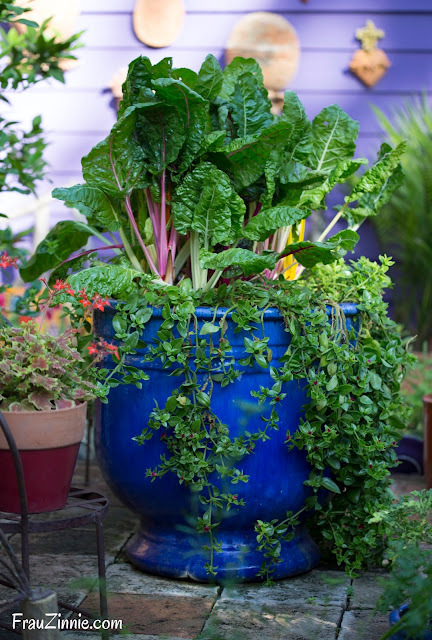 Some have a quick cycle of flowers and some last six to eight months from the first bud," he said. "Phalaenopsis is the easiest to grow. Some of the others you take care of a little differently." Watering orchids by ice cubes has become a trendy way to care for moth orchids. "Ice cubes are the one thing that has probably helped orchids more than anything else because people tend to overwater," he said. It's important to not put ice cubes directly on the plant. Instead, put them on the orchid bark or moss the orchid is planted in. "It's supposed to be one ounce of water a week (like a shot glass) for a four inch pot." The ice cube is roughly an ounce of water. A six inch pot can get two ounces, he explained. "I learned different ways to make orchids live," he said. "A lot of orchids survive and rebloom, but it's not foolproof," he said. Radiators, drafts, too much light or woodstoves can dry an orchid out quick, he said. "Orchids like it cool at night." A miniature phalaenopsis orchid for sale. "If you put orchids in the orchid pots, be prepared to water and mist a lot," he said. Pierson uses a tank sprayer to mist his orchids a little bit every day. "Misting is the number one thing." The trick to keeping orchids alive that are planted in moss is to keep the moss alive, he said. The natural habitat for orchids is the rain forest where they can be found growing on tree branches. "The key is providing a constant water source. Most orchids live on another plant." He has found that ferns and moss act as good companion plants to orchids, which he often combines into one pot. Ferns require a steady moisture supply, and moss needs to be kept wet so it does not draw moisture from the orchid. Too much water, however, is not good for orchids either. "If it's too wet, the leaves will turn yellow and the plant will rot," he said. "It will attract all sorts of bugs," he said. One of the most important ways to grow orchids successfully is discarding stagnant water. "If you have water on the bottom, you are usually overwatering to begin with," he said. "In still water, anything can develop and harm plants." After a year, orchids should be repotted with special orchid medium, which usually consists of wood chips and rocks. Presoaking the wood chips in fertilizer will reinvigorate the plant and produce new blooms, he said. Pierson prefers using aquarium water to fertilize his orchids. "The same nitrogen compounds the fish excrete as waste is used by plants and made into a soluble, pure form," he said. Pierson recommends lightly rubbing the plant's leaves to invigorate it. A trick he uses is rubbing a cloth wet with whole milk on the leaves, which gives the plant calcium. "It usually doubles its strength," he said. When handling orchids, it's possible to accidentally break off the flower spike when it emerges. "It's never a loss if you bust a stem off," he said. Breaking the stem will cause the plant to produce more stems. Many of Pierson's orchids have two to four flower spikes. To read more about Steve Pierson's new shop Natural Affairs Flower Shop, click here.